In June 2017 I participated in the artist-residency, "Once Upon Water", on volcanic Pico Island of the Portuguese island chain, Azores, along with 19 other international artists. I had the opportunity to continue my work underwater, exploring the intertidal zone that uniquely borders the open sea of the North Atlantic. The following blog is a daily journal that tells the story of my experience. The on-site color work that I do as a landscape painter is so important to the architectural color design that I practice with clients. Each time that I am in nature building an image with passages of color, I discover palette relationships, material quirks and nature's bounty of texture and form. The cognitive resource that is created from the explorations that I take locally and abroad expand my sensibilities, later enriching the creative problem solving that happens day-to-day. I am grateful to the Puffin Foundation, Ltd., who generously funded the materials for this project. I have to question my approach to packing for travel today, as I arrived at Pico Island and realized that I had under-estimated the potential for cold at this time of year in the Azores. At the last minute, I did stuff my light weight down jacket into my suitcase and have been living in it. My wardrobe, however, is heavy on bathing suits and summer staples; t-shirts, skirts, cover-ups, and shorts. The air that lifts my hat off my head(not the one with the string that I sail in - that's at home) has a New Foundland chill and the power of an offshore breeze. Luckily my pants are polyester/drip dry for the downpours that swap with flashes of sunlight throughout the day. I'd planned to get wet, though not with the chill of the North Atlantic here on land. I'd packed like I was going to sea, but in the sub-tropics - where you find bananas, palm trees, bougainvillea, and aloe. I hope that the weather trend is warming(it is summer solstice tomorrow). The artists that are participating in "Once Upon Water" met this evening in town to give a glimpse of past work and share intentions for the ten days here on Pico. It makes it easier to remember names when you also have images to put together with faces. Some artists are working with materials similar to me and many have brought wetsuits, snorkels, and fins. I prefer having someone to swim with especially in a new place. It is clear that there is potential for swim-buddies. I quickly took a few photographs as I walked to Madalena, the town where we are located. The basalt of the island cuts a sharp edge. It is also the main building material for homes and structures, particularly the early ones. What impresses me most is the limited color palette that allows the vegetation to stand out rather than the built environment. There is a simplicity to the homes that are in scale with the island and organic in nature. I like the looks of this place. The roar of the wind and surf beyond the glass of our apartment windows is fierce and doesn't change with the hour. It creates an atmosphere of uncertainty that makes me wonder how calm the water will get for snorkeling on this side of the island. I've seen some images posted by one of the participants of Portuguese Man-of-War that litter the beaches. I will check with the dive shops located near the ferry terminal to find out what the story is about the jellyfish bloom. I'm curious to see them from a distance but not too interested in getting tangled up with them. Today, we went as a group with the organizers of "Once Upon Water", Teresa Ascencao and Terry Costa, to see where some of the facilities are located around town. Our tour started at 10:30am, which allowed those of us who are sleep deprived a chance to catch up. We visited our studio spaces and learned where some options are for exhibition and performance. For me the highlight was the new library. Everything about the design is streamlined, spacious and takes full advantage of the view. We have a final gathering planned at the library and the space offers a variety of opportunities to share work. Our trip to the Wine Museum was a real surprise. In the very center of the courtyard was a magnificent 800-year-old Dragon Tree. The vineyard itself was planted within a maze of basalt stone walls. The contrast between stone and greenery unfamiliar, but made for an exotic landscape.. The 800-year-old plus Dragon Tree. Wine grapes planted within basalt walls at the edge of the sea. The light came streaming through the Eastern windows of the apartment this morning and made it hard to sleep "in". My reward for pulling myself out of bed this morning was an espresso sipped by the rocky edge of the property. It was nice to leisurely make morning plans and l took the time to talk to a few of the artists that are participating in "Once Upon Water". Last night some in our group had gone in a new direction along the coast road while I was still trying to raise my body temperature in the hot tub and sauna. Yesterday, I ventured into the natural pool that fills with the tide which is accessed by the patio. It was too shallow to swim, but I have been told that there are others like it made from the basalt to the South East of Baia da Barco. For the first time, I have taken my new easel and worked along the coast road below the hotel using gouache on Arches paper. The sea is much more colorful than it reveals from the edge of the property. I'm really excited about the color that I could see on the rocks beneath the quieting sea. It took some careful climbing over slick rocks to get down to the water's edge to wash brushes and fill my water carrier, but the vegetation on the rocks of the inter-tidal zone is beautiful and filled with variety. I have been told that there is an easier entrance to the water further South which I will look for this evening as we go to an event in that direction. 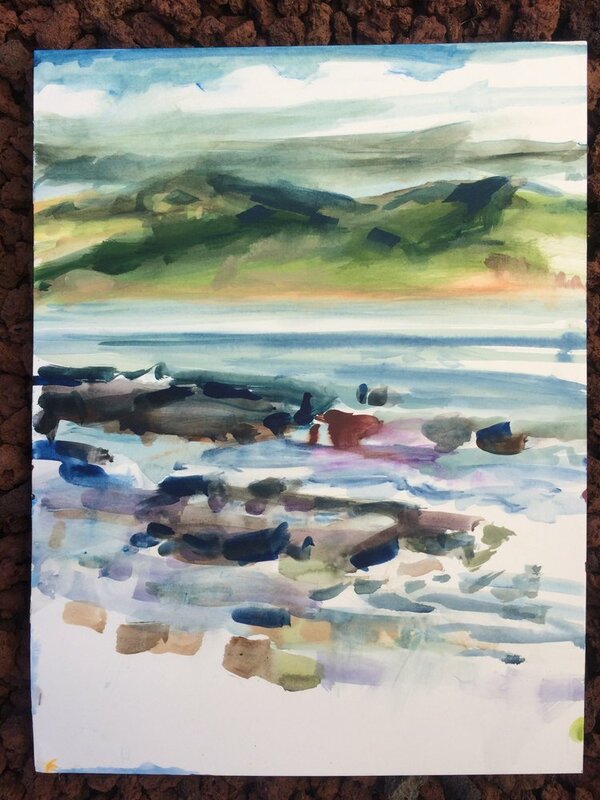 Late morning color study looking towards Faial Island, Azores. Wade Comer's snapshot of me working in the afternoon. The sunlight continued despite the weather predictions for our tour of the ocean floor on the "Ocean Eye" glass bottom boat this evening. It was amazingly monochromatic once we left the harbor and headed towards the rock islands that jut out of the water towards the north. There were small groupers, wrasse, bluefish, trigger and parrot fish. I was hoping to see more colorful plant life as we drifted with the current. We were told that the water was too cold at this time of year and the algae that was waving in the current would be leaving soon and new life would be more visible. It was a fun outing on the water though it makes me think that diving is limited. I will spend my time looking for ways to get into the the water from the shore. One of the rock islands that serve as a wall for fish to congregate. The swim this morning on the East side of the hotel was magnificent. The glass bottom boat tour was truly colorless in comparison. The rocky shore is carpeted with reds, greens, yellows, with interruptions of rock collections in soft gray and rust as I skin dive at high tide. The arrangement of colorful plant and animal life light up the underwater world! I found myself yelping with delight as I saw schools of fish frolicking against chartruese and feeding on soft ochre. One small silver green species of fish fluttered like leaves in a soft breeze. What a spectical. Once I found a way down the dry black lava rocks to the water, I slide carefully over some slippery yellow and pink algae covered stones to submerge. Thankfully there are natural step stones to a flat table rock which I spotted from the water, even closer to the hotel property to use for future access. I tried it out as my exit and it worked well. This afternoon, Haley and Liza went with me to see what I was raving about. They too saw large schools of brilliant fish and corals that rival the tropics. The tide was lower in the late afternoon and there was less variation in plant life, but the waters are teaming with luminous fish. One variety of white seaweed has a neon blue cast - not unlike the vibrant hue of the dreaded Man-of-War. I'm hoping that the calm water and strong sunlight continue for another couple of days so that I can finish the drawing that I started and make a few paintings from the study done in oil stick on Yupo paper. My new system of materials is working well and I am hopeful that I can create some images that capture the awesome experience in the wash of the coastline here in Pico. A sure sign that there are fish - a local fisherman returning from casting a line where I was swimming today. It was a perfect Azorian morning of blue sky and warm sun. I dressed for snorkeling and made my way down to the table rocks where I have started an underwater drawing. I watched a local fisherman working along the rocks while I ate my breakfast by the sea. He disappeared and then the tide pool was mine. I noticed that there were cobalt blue pools on the surface of the flat rocks and realized that the rolling surf was crashing every third wave, leaving luminous remnants of salt water behind. Hanging my toes over the ledge, I could see that the current would make it hard to stay in one place and draw in the water. I aborted my plan and decided to look for another place to swim that was calmer. Finding tide pools with easy access and interesting marine life is harder than I thought. The area past the fishing wharf where the dive trips tie up has a bottom that is relatively colorless. I wandered through Madalena to a public bathing area that looks a lot like an asphalt ramp rather than a beach where locals sit on towels and sun themselves before using a permanent step ladder to navigate the rocky edge into the salt water. There was too much jumping and splashing to make this a promising spot for fish. Later in the day, I met up with some of the other artists from "Once Upon Water" for lunch and then went to the school where we each have studio space for my appointment with Teresa, the program's administrator. Thankfully she was interested in getting something to eat so I could get a coffee and we could talk about my plans for the work that I had begun. It is helpful to have a local facilitator, something I have not had before with a fellowship or residency abroad. Here is Pico Mountain as it revealed itself a few minutes before sundown from the hotel. The perfect ending to my unproductive work day, I joined Jasmine, Camilla and Alex on their trip by car to the mountain cafe at Pico Mountain. The views were otherworldly, the water calm saffire, while the mountain was hidden in fog, then revealed throughout the climb. The soft, mossy green of the grazing pastures are all lined in black rock walls. At the base of the basalt gravel peak, the vegetation becomes alpine - miniature plants in a variety of colors and leaf patterns. We continued on our car tour to a lagoon, a whaling town and had a sumptuous seafood dinner in a fishing port at the end of the island. We made it back to Sao Roque for a performance by Terry Costa that was thought provoking and funny. This was a day that I could not have planned but worked out perfectly. The delicate flora at the Pico Mountain Reservation. Eight of us decided to charter a boat together from a dive shop downtown to swim with the dolphins and snorkel someplace new. The weather could not have been better; calm, sunny and warm. The boat was a 25foot inflatable, designed to take passengers and the ride was easy. Dolphins were everywhere. The captain decided to get with a pod of feeding common dolphins, that to me seem smaller than the dolphins I have seen before. The babies were tiny and hugged their mother's side as they swam in unison. My second chance to jump in with the spotted dolphins was a magical glimpse of mammals around and under me. This is the deep blue sea - over 800 - 1000 meters. Pelagic Shearwaters worked overhead and their feeding was fun to watch from below the surface. Another fascinating sighting was a flying fish that skimmed atop a thermal, parallel to our boat, for such a long time that we could watch it maneuver and see the beauty of its design. Later, I was happy to get into a calmer sea at the site of Thursdays drawing, though now there was seaweed littering the area and the churned ocean was still influenced by the current. The amount of turbulence made it too hard to draw but I could study the color of plants, follow trigger fish, parrot fish and others that make eye contact with you as you follow their motion. It was a good day for observing nature. This is what I came for. Tomorrow is suppose to be rainy and cold; perfect for working indoors. Our snorkeling site at noon today. Washing machine-like action of the natural/mason-enhanced swimming pool at the-waters-edge of Baia da Barca Hotel, Pico Island, Azores. Another day of rollers crashing ashore, disrupting my plans to swim and draw from my wonderful site next to the hotel. I went to town while I waited for conditions to change, hoping to find a few more oil sticks of bright yellow and chartreuse. This island is limited in art materials and I could not find Craypas in town. It is hard to change gears, but it is too dangerous to swim on this side of the island until the wind calms down or the wind changes direction. I've been told that this weather is unusual for June. 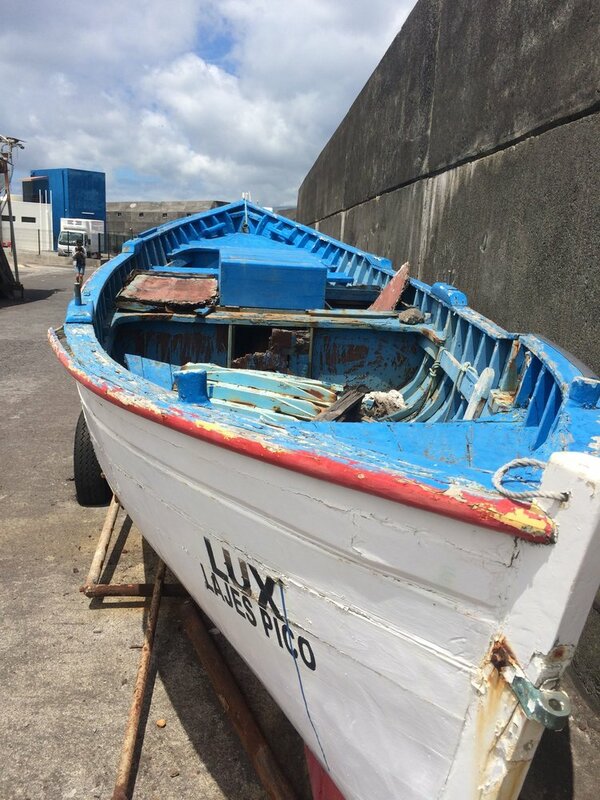 My wandering around the island today gave me a chance for an up-close look at some of the smaller fishing vessels. Clearly, this skiff is not being used but the shape has an organic quality that I find appealing. The paint job is a bit like Bert Dow's "Tidely- Idley"! I began this painting underwater when the sea was calm and visibility was wonderful. For a twenty-four hour period, I was able to snorkel three times at this rich site. Since that day, I have had trouble with wind and surf. The onshore breeze is unrelenting. The Atlantic wave action is foaming. I've begun a new image from memory but am anxious to get back into the water and keep checking conditions to find an opportunity. I'm a little frustrated! New strategy; get up early in the hopes that the conditions will be more suitable for snorkeling in AM. Wrong! The wind does not drop at night. I've tested this theory all week and the mornings are not calm and accommodating. 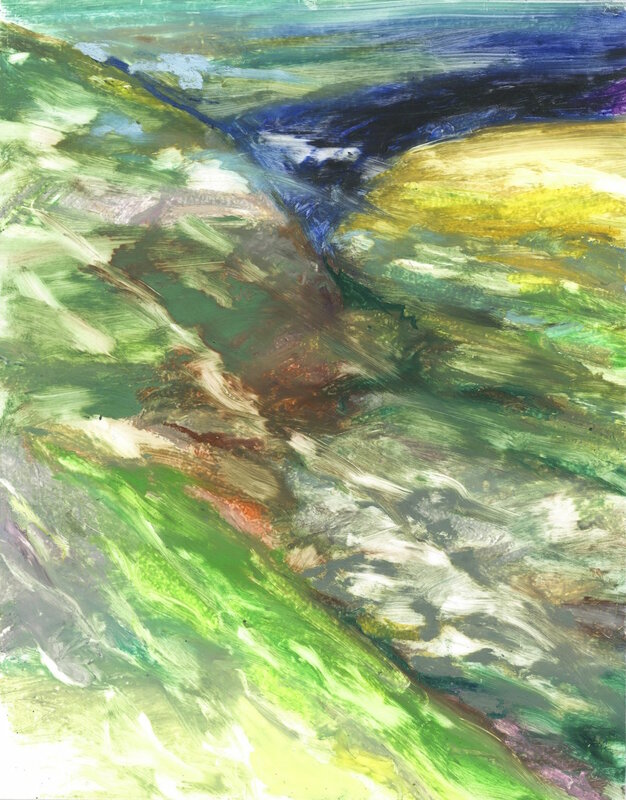 So I took my easel and decided to do a color study from above -sometimes it is helpful to see what colors reveal themselves on the surface of the water. Today, I worked in the wind and summer sun. Not a bad day by the ocean. A windy day on Pico Island! One of many! I thought that it might be crazy leaving the art supply store in the US without black when I bought paint for the trip. I usually do not use it except to make green with Mars Black and Cadmium Yellow Light. 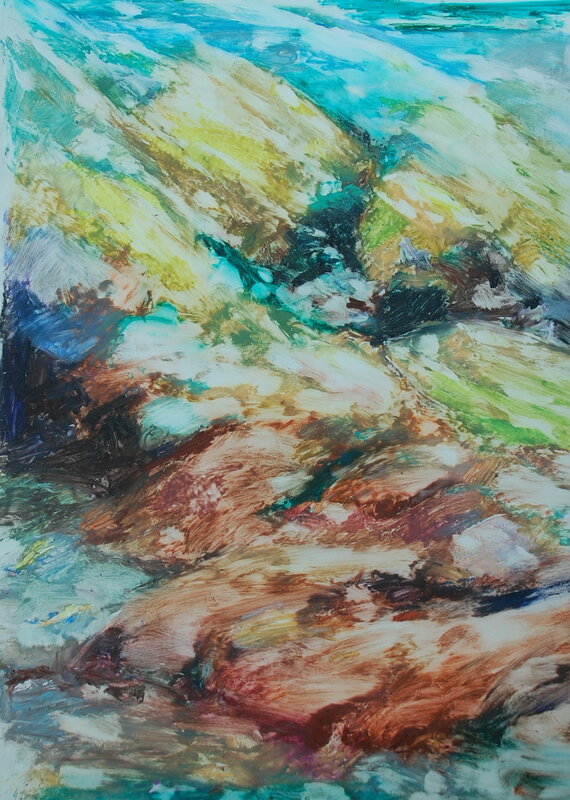 So, I came to study color at the edge of the sea, on a lava rock island hoping that my usual palette would work. And it did! For the deepest shadows of the jagged basalt, even underwater, it never required black. The rock that seems so deep in color is quite reflective of light due to its glass-like hardness. Lesson learned - volcanic-rock does not have the deep of black in relation to the colors on Pico Island. After hanging the color studies that I have done here on Pico along with the other artists displaying their work from the residency, I took advantage of the calm ocean to snorkel. The public access to the water that is next to the Cella Bar Restaurant is a beautiful place to swim and lit up with color. Here the bright yellow that you see on the rocks as the tide recedes is glowing! Lime green and soft reds drape the harsh angles of the rocks where fish of all sizes swirl and dart. There is a velvety texture to the algae that is nibbled by the smaller fish. The variety of swimmers is entertaining. What stands out most to me is the electric blue that many fish have along their fins. Some, like the triggerfish, have the contrast of a black spot and stripes, but the neon blue really catches my attention.